Have you been involved in a motorcycle accident in El Monte, CA? Did you sustain injuries or are you experiencing any pain, or trauma following your motorbike accident? 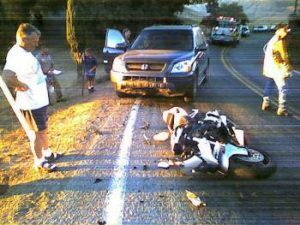 If yes, it’s advisable to seek legal counsel and be duly represented by a seasoned motorcycle accident attorney in El Monte. Don’t keep mute and bear the full burden of the cost of treatment, repairs or replacement of your motorcycle. Rawa Law Group is ready to assist you with our full legal might by taking up your case and assigning you the most reliable motorcycle accident attorney in El Monte, to ensure all your injuries, property damage, trauma is compensated for. Rawa Law Group’s team of seasoned lawyers has been helping El Monte claimants win cases in over 10 years of active service. Also, our legal team has over 55 years of collective experience. Our over a decade of active legal representation has seen hundreds of millions of dollars in settlements recovered for different clients. Attorneys at our law firm provide ethical legal counsel and are well-versed with these cases. They have the tact to prove beyond reasonable doubt that our plaintiff(s) – you – deserve the maximum benefits recommended by law for the motorcycle damage and injuries you sustained.